Here we are at the start of the final quarter of the year and it seems as though we have only just started 2017. A lot has happened thus far this year and we are not finished yet. September saw a meeting hosted by the DTI for a review of the current Industrial Policy Action Plan (IPAP) which includes among other sectors a substantial reference to the Forest and Forest products sub-sectors and included an update to the document for the 2017/18 year. We are hoping that through this document we will receive support from government for issues such as promotion of wood in the built environment and product development. September also saw the holding of the Second DANA Africa Forest Industry Investment Conference in Skukuza and by all accounts was a very informative and enlightening gathering. Also held in September was the 20th meeting and AGM of SALDEA. This event brought together the majority of the serious lumber dryers in the industry and was held at the Ingeli Motel at Weza. Included in the conference was a walk through the new Merensky mill at Weza to view its drying kilns, most impressive it was. 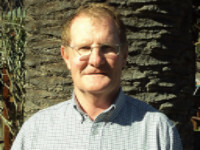 An encouraging aspect of the conference was the quality of the attending delegates and on more than one occasion I heard comments from some of the older generation that they felt that at last there was some exciting young talent in the sawmilling industry, very encouraging indeed. October will be a busy month for us sawmillers with the SAFCOL sponsored conference “Forestry Industrialisation Programme” early in the month followed by our own SSA Exco Meeting and then the Nukor sponsored “Second Timber Processing Conference”. All these gatherings taking place in JHB during the month. One of the more important meetings will take place on the 3rd October at the SAFCA offices in Isando to deal with the proposed changes to SANS 1783. This meeting will be hosted by us sawmillers and will include representatives of the ITC and the SABS as well as other interested parties. October also sees the holding of the SASDEA conference on the 19th and 20th in Boksberg and we hope to see as many of your sawdoctors there as possible. Please get in touch with Amanda Pretorius on 086 581 5775 if you have not already. News from the market place is less than encouraging with no real change from the position observed last month. It is tight out there for both the structural as well as the industrial segments and so we hope that the year end uptick will start soon and herald better conditions towards the end of the calendar year. Until next month keep cutting straight and drying flat. Wood-Mizer Africa’s authorised dealer in the DRC’s Kinshasa Province hosts an open day to launch a new Wood-Mizer branch in the country’s Equateur Province. Wood-Mizer’s LT15Wide Diesel sawmill ploughs through large diameter hardwoods during a recent open day to introduce the brand to Equateur Province. 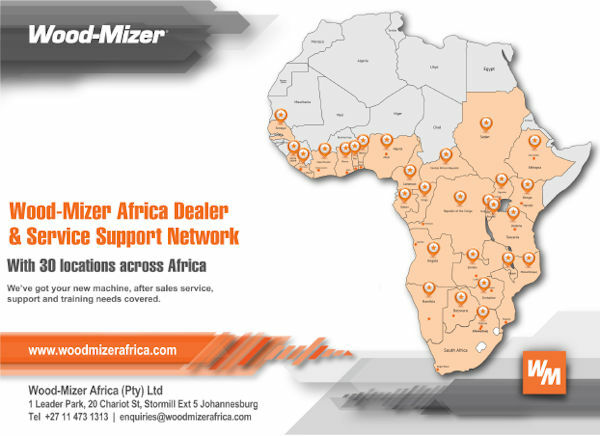 The open day and new dealership in Mbandaka, 800 km north of Kinshasa, is part of Wood-Mizer Africa’s on-going programme to expand its dealership network in the Democratic Republic of the Congo. The open day introduced Wood-Mizer’s range of sawmilling equipment to local sawmillers who still use outdated chainsaw-based sawmilling methods to process logs into sawn timber. The new branch will extend Wood-Mizer’s Authorised dealer for Kinshasa’s reach into Equateur Province. Sawmillers there will now have access to Wood-Mizer’s full range of sawmilling and secondary processing equipment including spares, blades, after-sales service, technical support and training. Despite the huge timber reserves on its doorstep that can drive its economic development, the Equateur Province remains backward and poorly developed. It can only be reached by air or water, which sees most of inhabitants resorting to subsistence farming to feed families and to provide for income with produce bartered up and down river. The lush tropical climate lends a hand to grow crops from the lush soils that lie adjacent to the Congo River and that stretches into the virgin tropical forests. The Congo River is the lifeblood of Equateur. The farming economy depends on its to send produce up or downstream. Modern conveniences like a motorbike taxi service that recently replaced bicycle taxis, also arrived by river. 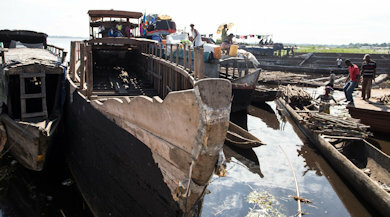 It links Equateur to the outside world with riverboats that ply the river ferrying goods to and from Kinshasa. Chainsaw-cut sawn timber sits in the harbour before departure for Kinshasa. It takes 4 months to cut 10 cubic meters of timber into sawn product. Riverboats ply up and down the Congo River from Mbandaka. 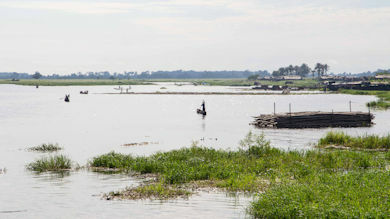 The river is the lifeblood of the region as it waters, feeds, transports and links the economy of the region together. 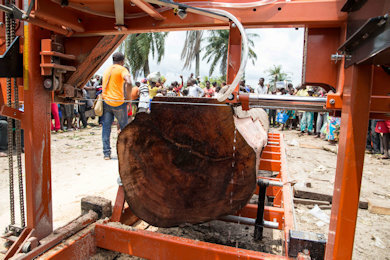 Logs that are felled during the dry season in the forest, also rely on the river’s increased water levels during the rainy season to float out of the forests and down to Kinshasa where they are processed into sawn timber or exported in raw log form. However, outdated sawmilling equipment, together with distant timber markets that can only be reached by water, has produced a pedestrian local timber economy that does not reflect the true timber wealth that Equateur holds. The few logs that are channelled to Mbandaka’s shipyards for boat-building applications, are painstakingly sawn into boards using chainsaws. Sawmillers say that it can take up to four months to cut ten cubic meters (m³) of sawn timber from the hardwood logs that are harvested nearby. The poor-quality board that is measured by eye for size also results in huge wastage. A 25-30% recovery rate is an accepted norm. Sawmillers make up for it by cutting down more trees. Add a slow river journey to distant markets with logs often hijacked midway together with the unpredictability of the weather that prevents logs from being moved from the forest to understand why Mbandaka’s timber economy has languished in the doldrums for so long. Wood-Mizer’s introduction to Mbandaka holds the promise of better fortunes for the town, its people and the region. 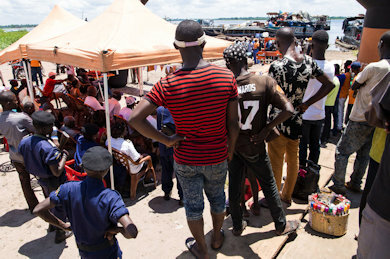 ConneX Forestry, Wood-Mizer’s authorised dealer in Kinshasa, arranged the two-day event at the local port in Mbandaka from where riverboats that ply the river arrive and depart. 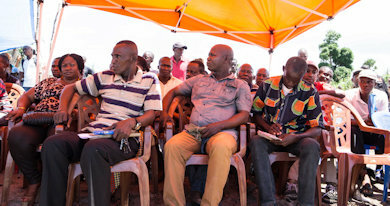 The aim of the event was to introduce Wood-Mizer to sawmillers in Equateur, with ConneX Forestry also securing premises that will house Wood-Mizer’s operations in Mbandaka. A readily available after sale service centre, spare parts and technical back-up close to the sawmillers, is a proven route to sawmilling success. Wood-Mizer’s premises in Mbandaka will provide the backup that sawmillers need to start a sawmilling business and keep it running for the full duration of the mill’s lifespan. 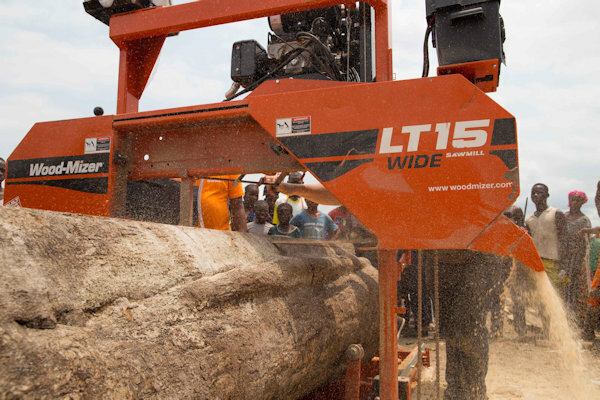 The availability of modern, dependable and regularly serviced sawmilling equipment that sawmillers can use to cut high quality, accurately sawn timber in a fast and productive way with a +70% recovery rate, is also the key to unlocking the timber wealth that lies on Mbandaka’s doorstep. The Wood-Mizer LT15Wide Diesel demo mill that ran sporadically during the event two-day event, produced 4 m³ of accurately sawn, high value timber. Measured against the four-month period required to cut 10 m³ of sawn timber with a chainsaw, this represents a huge leap forward in productivity that the sawmillers in Equateur now have access to. 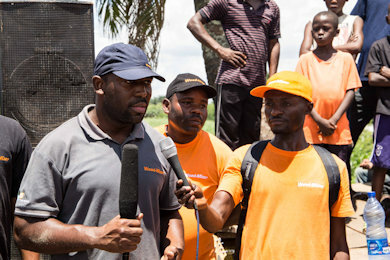 Faustin Ngassa, ConneX Forestry’s President Director General and Wood-Mizer’s Authorised dealer for DRC Kinshasa addresses the crowd during the launch event. Dignitaries, sawmillers, spectators and curious bystanders during the two-day Wood-Mizer launch event. The ability to send high quality sawn timber to market instead of raw logs, ensure higher returns for sawmillers and Mbandaka in the long term. How this fresh inflow of cash will impact on the lives of everyone involved in the timber supply chain is an open question? The mobility of the portable mill also boosts productivity and the income potential of sawmillers. Instead of relying on an unpredictable four-month rainy season to float the log out to a sawmilling site, sawn timber can now be produced throughout the year and transported directly to local, national or even international markets. It will also be easier, quicker and less risky to transport harvested timber to market. Round logs that are felled and floated from the forest if rainfall permits, and which then arrive at market after avoiding thieves and spending three weeks in the river and hoping to fetch a good price is inefficient, slow and financially risky. The ability to cut quality sawn timber onsite that can be sent directly by boat to market in larger volumes with higher selling price guaranteed means a more stable trading environment with more money in the sawmillers pocket. Unspoilt tropical forests frame the wide Congo River as it flows past Mbandaka in the DRC’s Equateur Province. Wood-Mizer’s modular design allow sawmillers to grow their businesses over time with more capacity added as income grows. A full range of power options including petrol, diesel and electric motors give sawmillers the flexibility to choose the power option that fit their needs the best. Blades that are designed to cut African hardwoods effectively together with a full range of blade maintenance equipment, give sawmillers the ability to maintain blades independently at prescribed standards in the remotest location. Broad socio-economic and environmental sustainability is also set to benefit from Wood-Mizer’s presence in Mbandaka. The impact of a revived timber economy on the long-term wellbeing of Mbandaka and Equateur is still to be determined. That the inflow of cash will spur innovation and inject fresh momentum into the local economy is without doubt. Wood-Mizer and ConneX Forestry are also coordinating efforts to replant areas in the rainforest that have disappeared as a result of logging activities. Less wastage and higher recovery means less trees need to be cut down to produce sawn material from. ConneX’s activities in Mbandaka includes identifying areas that require replanting and the species that are endemic to these areas. The long-term goal is to reinforce the message that timber has value and that replanting trees can protect biodiversity and create a sustainable timber business that can last for generations. Koos’ wife is busy in the kitchen with breakfast when she hears him making chaos in the TV Room. “Hey Koos, what you doing? She shouts at him. “I'm looking for the newspaper” he replies. “Time to come by my husband”, she shouts, “use the iPad”. Next minute there's a helse bang and a shatter noise. “Hey Koos, what the hell now” she shouts. Koos: “That bleddie spider didn't know what hit him!”…..